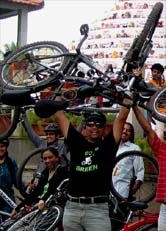 11 Dec 10 Go Green's Batti band-Ride - GGI-Group size: 4000+ Professionals, Increasing on day to day basis, Come & join us 2 serve Mother Nature. 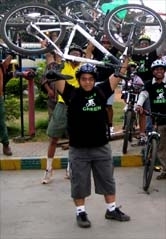 Go Green Group along with IYCN had organised a Bathi Ride on 11 Dec 2010 to promote message of switching off the lights when not required. being working day for most of them hence 15 GGI members particpated. 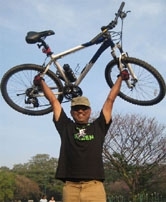 Started the ride from RIS junction @ 3:30pm and reached Cubbon Park's Queens Park by 4:00pm where we met other GGI's waiting for us. Then we started towards Opus located near Palace grounds. following was the route followed. A Painting that was being painted on Opus Wall while GGI-Members visited this place.